The past 4 months have flown by ! MiM has done a great job at making my experience in Moscow comfortable and interesting, while allowing me to be very independent and explore the city on my own. The mathematics has been very difficult and rewarding. It has been a pleasure to be in all of the courses and the professors have been very kind and passionate. Also, the food has been absolutely delicious !!! Thank you so much for this experience. It has truly shaped me. I hope to come back to this wonderful country. 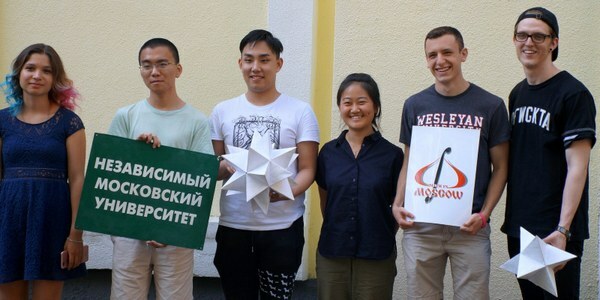 I recommend every student who is truly interested in mathematics and wish to challenge themselves to participate in the Math in Moscow program. I personally really enjoyed the difficulty of classes offered here as well as all the nice classmates I had here. The math environment here is really nice. I definitely learned a lot. Over the past four months I have learned a lot, mathematically and culturally. Before coming to Moscow, I had been aware that materials would be covered more and faster than in the U.S., so it was good to learn so much in a relatively short time. Our tutor (Артём) has been extremely helpful on helping us with the courses, and he even opened a special reading course for me and my roommate. Russian language course is also helpful for anyone who studies and lives in Russia, since it made our daily life easier. As for Moscow, I have enjoyed it more than I expected (even in winter). It has so much to offer, such as museums and ballets. Therefore I would recommend anyone who is really into math to apply for the program to study math at Russia and explore the city. Math in Moscow was an incredible, eye-opening experience for three reasons: firstly, I had never taken four advanced math courses in one semester, but the complete immersion in math helped me find fundamental similarities between my seemingly different classes, at the same time increasing my mathematical sophistication at a pace I thought impossible. And I was exposed to four different philosophies of doing math, simultaneously. The funny, talented professors helped made this all enjoyable. Secondly, studying the Russian language, in Russia, was truly the best and most memorable part. When I arrived in Moscow I knew no Russian at all, but I took the INCREDIBLE Russian language course for a semester and slowly learned enough Russian to interact with locals meaningfully. I will never forget my two hour-long Uber ride to the airport where I talked with my driver (in Russian!!) for the full two hours, about topics as diverse as “What foods do you like here?” and “When are you going to get married?” (that question caught me by surprise.) And thirdly, I got to meet Russian people and interact with them, and at this time in the shaky relationship between the governments of US and Russia I believe it’s important to continue building bridges on a personal level. Additionally, I was exposed to a completely different way of interacting with people there, the Eastern European way, and it was super fascinating and fun. You’ll just have to go on the program to see firsthand what I mean… In summary, this program is a gem, go on it, it’ll change your life for the better.